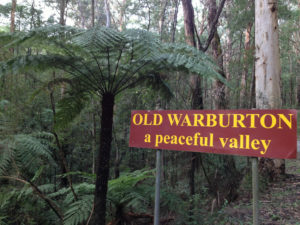 The Old Warburton Residents Association was formed recently as a response to news that our little community is right in the middle of the Yarra Ranges Councils planned “Mountain Bike Destination Project”. Most proposed trails are in and around Old Warburton, running between our properties, close to some houses, and all over the slopes of Mt Little Joe and Mt Tugwell either side of us. This is a large $6 million dollar infrastructure project that council predicts will bring 130 000 visitors annually. We resent our quiet little settlement being turned into a playground for tourists and consider it to be an example of totally inappropriate development . We are not anti mountain bike or against the idea of a mountain bike project for Warburton but we are unanimously opposed to the proposal in its current form. The proposed trailhead is on Mt Tugwell and all tracks finish in Warburton township. These are downhill trails built for one way use only so riders will be ferried back up to the top by bus or private car. Going by the number of riders projected to use these trails, residents can expect thousands of extra vehicles annually using our narrow and dangerous road. This poses an unacceptable risk and will result in a significant loss of amenity to all residents along the shuttling route. Yarra Ranges council say they are currently in the consultation stage, but the truth is, the decision to build these trails in Old Warburton was made a long time ago. This was before most residents knew anything about this project. Plans are well developed and federal and state funding already sought. We have found certain members of the councils “active living team” (who are supposed to be consulting with us) to be rude and dismissive of our concerns. The proposed trail head car park and other infrastructure is on Mt Tugwell. Yarra Ranges Council say they will “convene a panel to minimise impacts” and use “cutting edge trail design” to protect possums. This does nothing to alleviate our concerns. It is totally inappropriate to place a large development like this in an area that is habitat to our critically endangered state faunal emblem. 2014, 2016 Government authorities identified existing Critically Endangered Leadbeater’s Possum colonies within logging zones and the surrounding Central Highlands Forest of Mt Tugwell/Mt Bride Zone. The forest buffering identified as suitable forest habitat highly likely to contain unidentified colonies of the Critically Endangered Leadbeater’s Possum, also acknowledged by authorities and researchers.Concerned contact: Federal Minister for the Environment. The Hon. Josh Frydenberg MP www.aph.gov.au/J_Frydenberg_MP and Assistant Minister for the Environmen. The Hon. Melissa Price MP www.aph.gov.au/M_Price_MPPlease click here for more information. There are a number of significant heritage sites associated with Old Warburton’s heyday as a gold mining town in the 1870s. Mountain bike tracks and the large number of visitors they bring, will damage these sites. One proposed track goes right through the middle of heritage overlay HO342. Old Warburton is a place of quiet beauty and fragile environments with the creeks and gullies slowly recovering from the ravages of mining all those years ago. Lyrebirds and koalas make the place their home along with numerous other birds and animals. Bringing thousands of tourists into this environment will cause irreparable and ongoing damage. We are particularly concerned about the erosion that could be caused by the tracks themselves, and by the humans that leave the tracks to explore the area. Privacy is defined as “a state in which one is not observed or disturbed by other people”. Amenity is “the pleasantness or attractiveness of a place”. We choose to live in a place that has limited services (no mains power, water or phone) because we are happy to make that sacrifice in return for the peace and quiet that Old Warburton provides. If this project went ahead we’d have tens of thousands of visitors passing through our little settlement annually. It is a huge imposition on a group of residents who have everything to lose but nothing to gain from this project. DELWP 2016 Interim Recomendations For Mountain Biking (pg4, Access). As locals will be aware, Mt Little Joe is very prone to bushfires. The settlement of Old Warburton was burnt out in Ash Wednesday 1983 and then again in 1991. We know that it is only a matter of time before this happens again and also that fires can move quickly. In such an emergency, any riders on these proposed trails would be in grave danger. If the Old Warburton rd is clogged with tourists we too will be at greater risk, with our escape route potentially blocked, and access for emergency vehicles compromised. In their 2015 – 2016 Interim Recommendations for Mountain Biking, DELWP describe closing illegal MTB trails because “shuttling on Old Warburton Rd has detrimentally impacted the amenity of local residents”. They also say “No tracks were proposed or considered in the Old Warburton Zone and the development of specific MTB trails in this zone is not considered appropriate”. We cannot understand how DELWP now supports the building of a mountain bike park in an area they previously believed was totally unsuitable. With the possibility of thousands of people filing along our boundaries annually we have well founded liability concerns . Many properties have mineshafts, dams and many other hazards. Some residents shoot feral deer on their properties. Short of expensive and ugly fencing we see no way of stopping people wandering onto private land. We will also be at higher risk of being robbed, as demonstrated by the many cases where thieves have used the rail trail as access to sheds and outbuildings on rural properties.. If the Yarra Ranges Council gets permission from DELWP to build these trails in what is now State Forest, the trails would then be handed over to an Incorporated Association to operate and manage as they see fit. If, as the council predicts, international events are held here, these trails could become a multi-million dollar business. This sounds to us like the corporatisation of a public asset. Nothing like this has ever happened in Victoria and we think it sets a dangerous precedent. Mountain bike trails need to be built away from residential areas and shuttling routes should not go past people’s houses. If you have concerns, we urge you to make contact with the council or your state or federal representative and let them know your views. (click here for contact list) You can also sign our online petition (click here for petition) .To see trail alignments that may affect you (click here for maps). It’s not too late to prevent this project from becoming a disaster we will forever regret. View the master plan maps.